Today was not what I expected! Well, it started okay, but then came the waiting. So first, we got up and ate breakfast, then started school. Christian (the 10 year old) had a doctor appointment scheduled for mid-afternoon, so I wanted to get as much school done as possible early in the day. I also started supper in the slow cooker while the kids were reading so we wouldn’t be tempted to eat out tonight. The homeschooling went really well. Then it was time to head out for the doctor appointment. I should’ve only taken Christian with me. But no, I let “Mommy guilt” overcome me and decided to take all the kids when a couple of them starting begging to come along. I knew better. I’ve been down this road before. But I said ‘yes’ anyway, and we all loaded up to go to the appointment. Christian has had trouble with ear infections, fluid in his ears, and hearing loss for most of his life. He’s had tubes 3 times, his tonsils and adenoids removed, and speech therapy for 2+ years. When he started complaining about not being able to hear a couple of weeks ago, we initially went to our local clinic, but when they couldn’t identify the problem, we made this appointment to go back to the ENT. When we got there, the other (older) kids decided they’d rather watch a movie in the truck than sit inside the doctor’s office. Since Caleb is 16 and I knew I could see them from the office, I agreed to let them wait there. They kept the truck running and turned on a movie. Christian and Asher and I were inside. 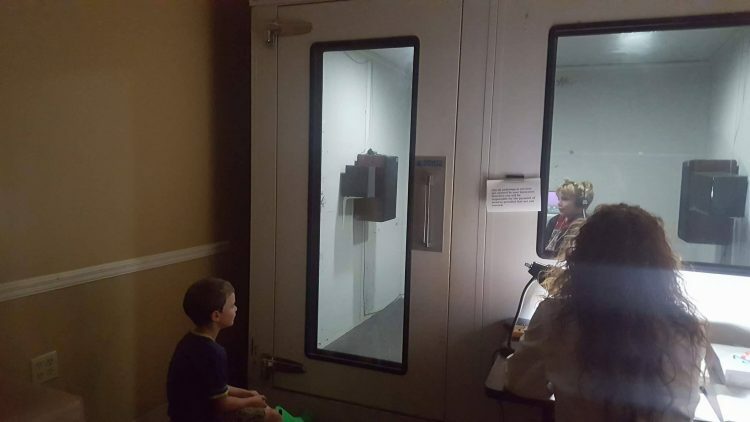 Asher watching Christian doing the hearing tests in the sound-proof booth. One hour and 20+ minutes later, we finally were done. I had no idea the whole thing would take that long and gosh – it didn’t really go as I expected. Not only did they confirm fluid in his ears and hearing loss, but they scheduled for him to have more tubes. On Thursday. Talk about throwing a wrench in my plans for the week. I had no idea we’d be doing surgery in 3 days. Don’t misunderstand – I’m thrilled that we’ll be getting his hearing and ears fixed up in such a short time. It just wasn’t how I expected the day to go. Then because of the short notice, I had to go straight to the hospital to get his pre-op done. More than an hour later (again), we had everything set. If you’re keeping count, that means my kids had waited. And waited. And waited. For more than 3.5 hours. Miraculously, they’d not caused a scene anywhere… haha! 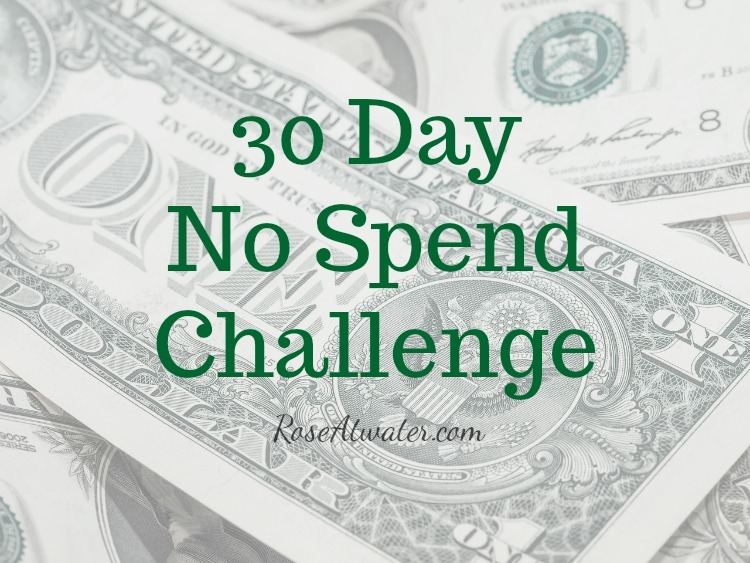 But to make the day more complicated, I needed to stop by Walmart for groceries and ingredients for a sponsored post due by 11am tomorrow. And we had an appointment at home already scheduled for 5:30. It was already after 4pm. I had to fly through Walmart at lightening speed (without my list, by the way, which was on the table at home). Ugh! So, that was that. I made it back to my appointment (barely), then came home, ate supper, and started working on this sponsored post. I didn’t finish until a few minutes ago (nearly 2am), so now… I’m off to sleep. Hopefully a little later than usual… haha! Cheese, mushrooms, potatoes, cabbage (for a school project), tea, carrots, pears, tomatoes, bread, salad and croutons. Not too bad… the croutons and tea weren’t on our original list, but we’re having company tomorrow night and needed them for tea (obviously) and salad. 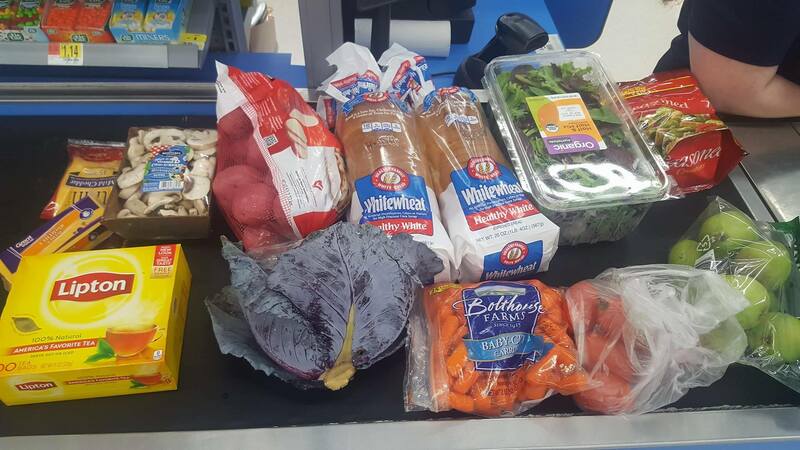 The awesome thing is – all of that, including lots of fresh fruit and veggies only cost $40.91. We’re still WAY under budget as of now! Supper : Slow Cooker Honey Mustard Chicken (chicken from the freezer), Salad, Fresh Carrots & Cucumbers (for the kids who won’t eat salad), and rice. The Slow Cooker Honey Mustard Chicken was a bust. I mean, we ate it, but I won’t make it again. Bleh! Other than that, a good day! We managed to spend several hours out and about in a town with fast food and not eat out!! YAY! Okay – I’m off to bed finally! I’m at hospital now for pre-op, having screws put in pelvis on Friday. I Love following you on your blog, my husband has a lot of relatives that live in Meadville, I’m to old to decorate cakes anymore. Pray your son does well after his surgery. I am sorry Christian has to get ear tubes again, but I can understand. I am on my second set. The last set the ENT put in while I was in his office. I ears were so plugged my eardrums were bulging and it was a relief as so has he poked the hole. Have you ever had Christian tested for food allergies? I figured out that my ears are more plugged when I eat dairy. I finally got my ears clear and then I ate ice cream and they completely plugged up again! So, now I avoid dairy, except for some cheese.